Oy lads. Point them bows properly. No! Not at Gaghit! Dunno ... look like trouble to me. 'Ear, keep it quiet. Don't look at 'em and they might not bash yer! So, I'm meant to be painting Ratrak's arrer boyz for this challenge, plus a chaos warrior. 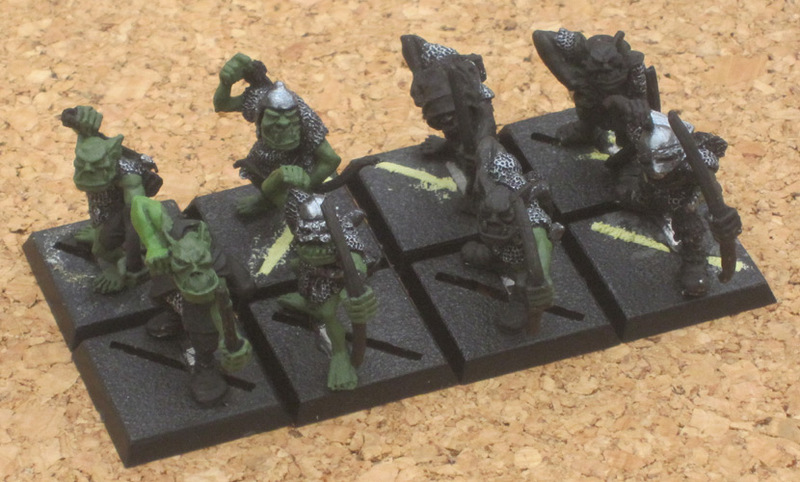 Then suddenly I need a 500pt warband in a bit less than 2 weeks, which is 20+ orcs to paint or 5 chaos types (with what I have already), so a bit of a no-brainer. Hopefully I'll get back to the orcs before the end of the month. Nice figures, but be wary if you want to rank them up in units. Being at 45 degrees helps when they're squeezing up. You might have problems if they're all 90 degrees. Obviously not a problem if they're going to skirmish. Just remember, painting is fun - no, really. @Hetz - it's all about how you rank them up, really not much more complicated than a game of Tetris The right-hand-most place on the rank is always the most popular though! A week later, and only 4 painting evenings between when these pics were taken this morning and them needing to be ready for the table. I'm not worried, honest! A few changes of plan in the meantime... My minotaur lord is proving difficult to strip, and I want to be sure to do a good job on him as I've been wanting to paint him for about 25 years. 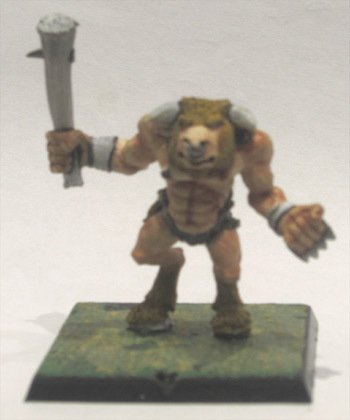 So I've pulled out another half-painted (again, from years ago) minotaur to replace him. I've also got side-tracked from my planned chaos sorcerer and have given into my broo runepriest who's been whispering "paint meeee" as I work. I'm fairly sure it's a daft tactical decision, as he'll have to be a level lower than the sorcerer on account of beastmen points values, but it's the taking part that counts! The runepriest has only had an undercoat so far. The pic shows the warriors with the gun metal and first silver highlight, they've also all since had a second highlight. Daethskar's had his ink washes and basically just needs the back of his shield and his plume painting. The latter is proving problematic at the moment though Cedric I've slightly run out of inspiration on, so he's going to stay metal at this stage. He's done apart from his final leather highlight and the small matter of his shield. Go Grumdril, go! I like the progress you've done so far, the metals look very good and so does the minotaur! Just about finished in time... Bases not done, but otherwise they're ready for the table. He's a bit washed out in the picture, but of the group I'm happiest with the minotaur. I wasn't happy with Daethskar when the washes first went on, but he's grown on me since. Cedric's a bit bland, he needs a better shield execution to rescue him, but my skills aren't up to it at the moment. And the runepriest lacks something, I think in hindsight I chose a bad palette for him, perhaps his goat side and his robes are too close in tone. The robes were meant to be the same colours as the 3rd ed cover chaos sorceror, perhaps if I re-do him tending more to the lilac that'd be better. They'll have to do for now though, it'll likely be years before I re-visit them. And the warband all together. On Friday night they looked even better on the tabletop where all true fighting figures should be. They may have been few in number, but their numbers will grow in time as their reputation becomes known, their display on Friday night - did you proud beating off the Orcs, Goblins and more goblins, if I recall correctly. 'ere boss! They're back again. I see that, idiot. Keep quiet! Maybe they'll go again without killin' anyone. Loot 'n' prisoners eh? Sure thing boss! ... 'Ere, wait a minute. Your boss's a stunty. 'E'll kill us soon as look at us. If you say so guv. Gaghit, go get the boss an' tell 'im to bring 'is lads. Tell 'im abaat the loot 'n' prisoners! With the archers finally (mostly) done it's time to turn to my next unit. I'm getting a bit ambitious this time, about 16 boyz plus a shaman. 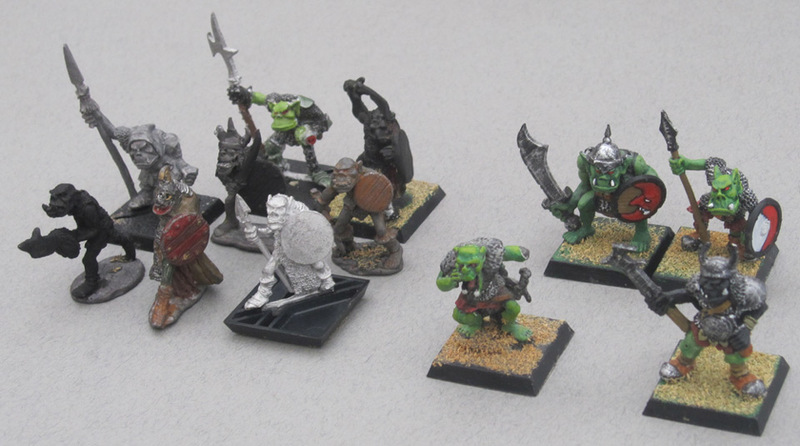 I also need to re-touch the paint job of my orc general, and since chaos dwarves and orcs don't get on I've written Grumdin out of the picture for now so he'll need a replacement warrior. I've also got some bits of converting to do. If you're counting you'll notice there are only 12 of them. Erny's hopefully sending me some more of the plastic ones to make up the numbers - I was originally going to start with a unit of 10 but I'm thinking an extra 4 monopose figures will be relatively quick to paint. 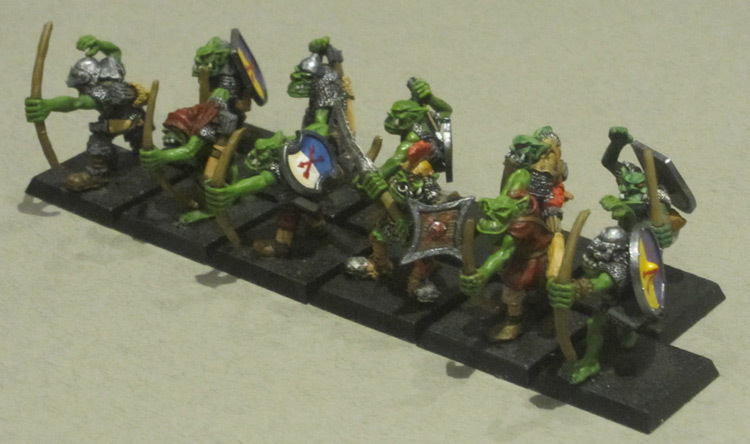 The two chaps at the back right will just get new shields and bases, and Harboth the same plus green skin. The shouty chap with no arm will be the standard bearer. I've never owned him with both arms. I don't remember the history of that particular trade, I've always liked the figure but I hope I didn't swap him for anything too valuable About 25 years ago I gave him a tentacle to hold the banner with, hopefully I can stretch to an arm this time.